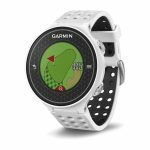 The Garmin Approach S6 is a golf-themed smartwatch that is meant to help players out on a course. It has precise maps and calculations for more than 40,000 golf courses around the world, with more available to download online. In addition, it tracks the current location of your ball, which also allows you to monitor stats regarding your skill and game. Other features include swing metrics, handicap and score tracking, and access to Garmin Connect Golf. The watch can double as a smartwatch and receive notifications from an Android or iOS phone via Bluetooth.